Posted on May 14, 2018 by Aliya A. 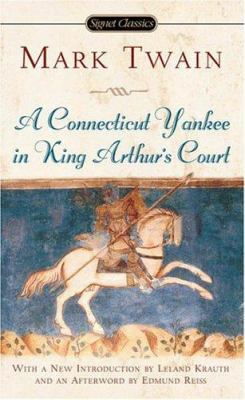 In A Connecticut Yankee in King Arthur’s Court, Mark Twain chronicles the experience of an engineer from the nineteenth century who goes back in time to King Arthur’s era in the sixth century. Hank Morgan, the protagonist, is bewildered at first to find himself in a strange land after taking a blow to the head. He is captured by a knight and taken to Camelot, where he makes the acquaintance of a page and learns that he is in the past. A series of events ensues, in which Morgan convinces everyone that he is a magician and secures a spot in the King’s administration for himself. Since he’s from the nineteenth century, he tries to modernize the sixth century to reflect his time period (which is probably easier for him than another person because he’s an engineer). I found the beginning of the book to be a bit slow, but it started picking up near the middle. There are funny parts to it and other parts that made me mad at some of the characters. There are also sections that were excerpted from Le Morte D’Arthur, some of which I found difficult to read (the ones describing battles), and at times, Twain seems to be criticizing some aspects of the world he himself was living in, in the nineteenth century, like slavery. The ending was a bit ambiguous, but considering the nature of the story, I felt that it was appropriate. A Connecticut Yankee in King Arthur’s Court by Mark Twain is available for checkout from the Mission Viejo Library. This entry was posted in Book Reviews and tagged fantasy, king arthur, knights, satire, time travel by Aliya A.. Bookmark the permalink.